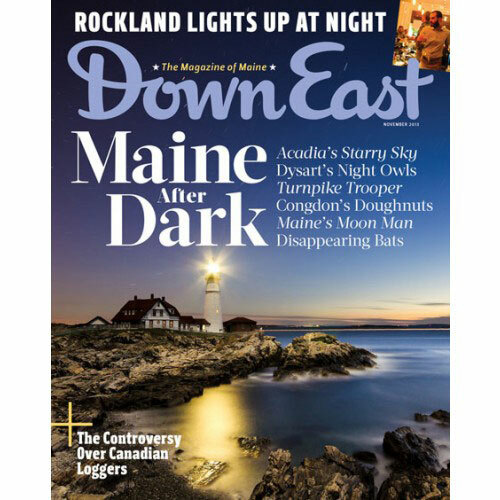 In this special issue, we explore the dark half of the day in Maine. Stargazers are flocking to Mount Desert Island, which boasts the largest expanse of dark sky in the East. Exploring the lives of Mainers who go to work after the sun goes down. Maine has lost 90 to 100 percent of its wintering cave bats. Now, scientists around the state are scrambling to save the survivors from a deadly fungus. 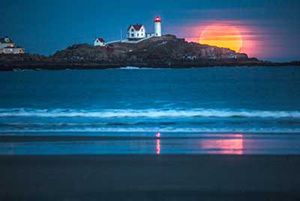 One Maine photographer’s quest to capture the full moon. If the midcoast had a Times Square, this would be it. With an independent movie theater and a string of trendy bars and restaurants, downtown Rockland offers more than you might expect after the sun goes down. Acclaimed photographer Melonie Bennett leaves behind her usual subjects — her family members — to capture scenes of nightlife at a Standish bar. Can you identify this wild waterfall? 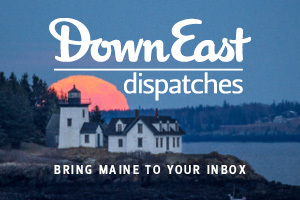 What is Maine’s best spot for stargazing? Thanksgiving is Black Thursday around the country, but not in Maine, where blue laws keep most stores closed. The failed balloon journey that Mainers will long remember. Why are there Canadian loggers in the Maine woods? A vibrant palette and contemporary touches enliven an architectural classic in Portland. Sandra L. Oliver offers tasty, healthful recipes for game meat. As one of the only bagpipe makers in the country, Chris Pinchbeck will challenge whatever notions you have about this (supposedly) Celtic instrument. How my father found purpose among autumn’s fallen leaves. Dig in to everything from pizza to charcuterie at When Pigs Fly in Kittery. Winslow Homer’s Civil War at the Portland Museum of Art celebrates a Maine artist’s early commercial illustrations. After ten years, WCSH6’s magazine show 207 is as much a part of Mainers’ nightly ritual as supper.  A Look Back at Down East Thirty-Six Years Ago.